Doug experienced seasonal allergies for as long as he could remember. In reality he had always had some form of post nasal drip, but come fall in Austin he was miserable. He woke with his head in a fog, the sinus pressure at times felt unbearable, body aches prevailed and naturally it affected his mood, making him both irritable and a bit hopeless. Of course he had tried everything—or at least what most allergy sufferers in Austin have tried—acupuncture, a neti pod, herbs, and even rounds of antibiotics for reoccurring sinus infections. He finally resorted to taking his daily dose of Zyrtec, which still only minimized his symptoms. It is important to note here that addressing chronic allergy symptoms in individuals at the peak of the season is challenging, and like all protocols, the success is very dependent on the compliance. He had suffered from frequent ENT infections as a child. He experienced digestive difficulties that ranged from sluggish bowels to bloating and loose stools since his early twenties. He often woke feeling exhausted and with aches in his joints. While he had eliminated gluten from his diet, he still consumed dairy products. Fix the output by supporting and cleaning out the digestive organs, including the liver. Improve the input by eliminating further inflammatory foods. Give relief to his ears, nose, and eyes struggling with the secondary symptoms. The root of Doug’s problem was actually a bit of a distance from his sinuses. It originated in his digestive tract. I know that because when the bowels are not able to eliminate and clean the body at least twice a day with normal formed stools, the acid must go somewhere. Most often that is up in search of the next emergency exit—the sinus cavity. 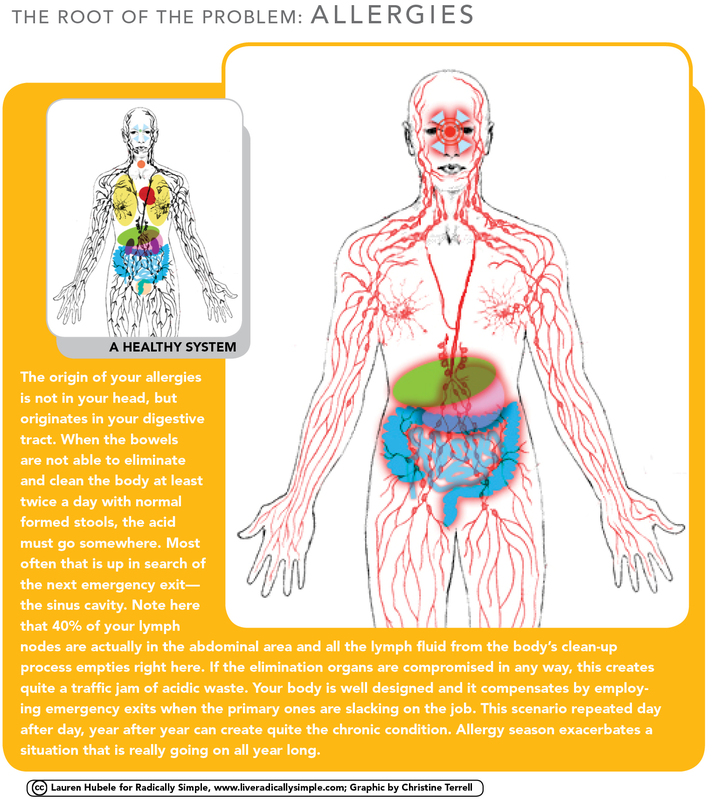 Take a look here at our graphic and note that 40% of the lymph nodes are actually in this abdominal area and all the lymph fluid from the body’s clean-up process empties right here. If the elimination organs are compromised in any way, this creates quite a traffic jam of acidic waste. Your body is well designed and it compensates by employing emergency exits when the primary ones are slacking on the job. This scenario repeated day after day, year after year can create quite the chronic condition. 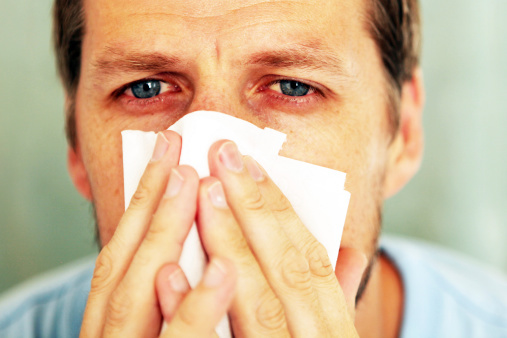 Allergy season exacerbates a situation that is really going on all year long. Improve the output with a gemmotherapy protocol supporting bowels and liver. Remove dairy products from the diet. Take a 14 day course of intensive probiotics followed by a daily dose throughout this season to re-establish good bacteria in the gut. Offer an acute gemmotherapy formula for the sinus symptoms as needed. Within the month Doug was symptom free—not only with his sinus symptoms but the body aches and foggy head as well. His improvement was so dramatic I actually did not see him for some time. When I did finally, he told me he continued to keep dairy and gluten out of his diet and hasn’t had an allergy symptom the past two seasons. Though I might like to pat myself on the back for helping Doug, he really did the heavy lifting by being open to making the dietary changes needed. Not all of my clients have such immediate and lasting results. I’ve learned over time while following similar cases that homeopathy and gemmotherapy protocols open up the body to clean, but filling it back up with inflammatory foods leads to an endless battle of symptoms. If you are still struggling with yourself about dairy and its place in your diet, you’ll want to watch for my post about that next week.